I have a law firm in Bloomfield Hills where I specialize in divorce, child custody, mediation, arbitration, and collaborative law. I am a former Chairperson of the Family Law Section of the State Bar of Michigan, former President of the Michigan Chapter of the American Academy of Matrimonial Lawyers, recipient of the 2004 Oakland County Bar Association Professionalism award. Chairperson of the Long Range Planning Committee of the National American Academy of Matrimonial Lawyers. Member of the International Academy of Matrimonial Lawyers. I was a legal columnist for the Oakland Press. I have written many articles on family law related subjects, as well as the chapter on Alimony/Spousal Support for the book; Michigan Family Law, which is used by lawyers and judges throughout Michigan. I am the producer and host of the award winning cable television show, Practical Law and am currently podcasting on the internet on divorcesourceradio.com. I am a frequent blogger for the Divorce Section of the Huffington Post. Community Service - I was one of the founders and a past president of The Sanctuary, a runaway shelter for teens which is now part of Common Ground. I have also served on the board of directors of Jewish Family Service, Catholic Social Services of Oakland County, and the Fresh Air Society. Travel, Movies, Photography, Reading, spending time with my grandchildren. I went to Monteith College which was part of Wayne State University and no longer exists. I was president of the Monteith College Student Faculty Council. Upon graduation I went to the University of Michigan Law School, where I graduated with a Juris Doctorate in 1968. While at U of M I was on the board of the Cinema Guild which produced the Ann Arbor Film Festival which still exists today. I remember playing clarinet in the high school band and orchestra. The band director was "Smiling" Jack Shelby - a real task master to say the least. 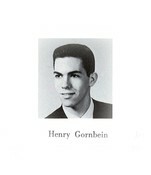 Henry Gornbein has a birthday today.